Every day across the country IGA Community Chest raises funds to support the local communities, charities and other worthwhile causes. We’ve helped raise well over $70m to help our locals. At IGA Lennox Head, our goal at the store is to support the kids at our local schools and support their favourite sporting and recreational activities to ensure they are spoilt for choice. We support surfing, soccer, cricket, netball, athletics, all codes of football and those community organisations that keep us all looked after such as the amazing surf life saving club, great people in the rural fire service and the tireless efforts of the Westpac helicopter rescue. Well, every time a customer spends $30 we donate 10cents on your behalf, to the junior sporting team, local school or charity of your choice from the above list. So please make sure you grab a token at the registers and place it in the community chest box located at the front of the store. 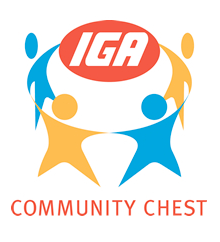 To boost these community chest dollars every time you purchase an IGA branded product 1cent is also donated to the community chest total and is divided amongst the above groups. So remember the more you spend the more we donate!